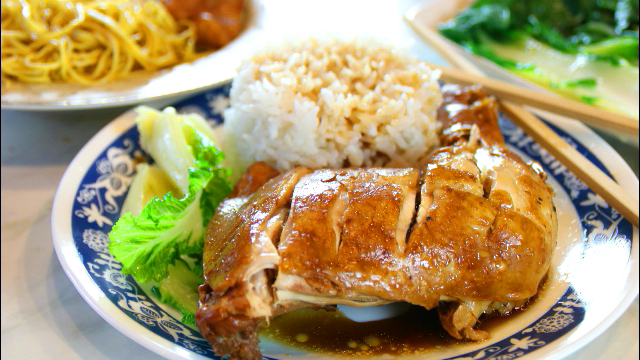 Soy sauce chicken is a clone of a Cantonese Chinese dish which developed in Hong Kong. It has, however spread to kitchens and restaurant around the globe. It is very simple and easy to make and incredibly delicious. I serve this up on a fairly regular basis to my family and friends, and they simple love it. Always, they ask for the recipe. I have to say, it is one of my favorite too. There are a few alterations you can make to the dish. For example, if you are a garlic or ginger lover, you can add more. If you are not, you can add less. The same concept stands for the green onions and ground black pepper. I use a combination of dark and light soy sauce which refers to the viscosity and not the color, but you can use just one kind if you like. The dark soy sauce can be purchased in just about any grocery store and is referred to as Chinese soy sauce. The dish can be served up with just about any side dish; although, I prefer rice. Noodles or mashed potatoes are nice as well. Give our soy sauce chicken a try and let us know what you think. In a good size pot, add the water, soy sauce, brown sugar, green onions, ginger, garlic, star anise, and pepper. Stir until it is well combined. Place the chicken thighs in, cover with a lid, and bring it to a boil over medium hight heat. After a boil, reduce the heat to medium and allow to simmer for 30 to 40 minutes. Serve with some hot rice or noodles with the sauce over the top. Enjoy your soy sauce chicken.